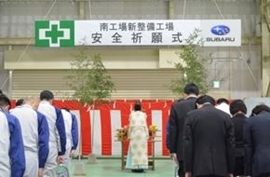 Tokyo, January 18, 2018 – Subaru Corporation today celebrated the completion of a new facility that will be utilized for the maintenance of the next-generation utility helicopter (the Japan Ground Self-Defense Force UH-X*1) and the new commercial variant of the 412EPI*2 helicopter at its Aerospace Company Utsunomiya Plant, Tochigi Prefecture. *1 Successor to the UH-1J utility helicopter currently in operation. Production of approximately 150 aircraft is planned. *2 Model based on the same platform as UH-X, to be manufactured and sold to countries worldwide.